Terry and Amy Harrison had the unusual convenience of only having to attend one college graduation ceremony for each other. Why? Because they graduated at the same time with degrees from Florida Tech! The Harrisons earned their bachelor’s degrees 100% online and walked across the stage at the Fall 2017 commencement ceremony. 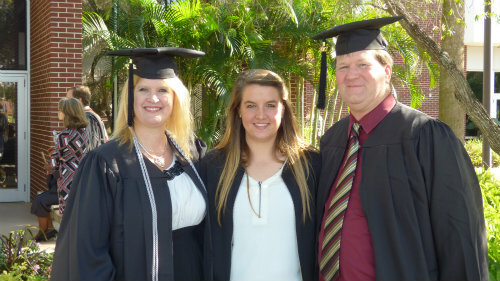 Terry earned his in accounting; Amy in business management. Both were able to complete this journey while having full-time jobs, three kids and getting married along the way. We talked to them about going through this academic journey together. Amy: Terry and I met when I was going through a divorce, with my previous husband, and it was kind of rocky at first, but things worked out really well. We both like competition, and so both of us would cheer the other on whenever the other person would have tests and stuff, and it just continued on, and that’s how we formed our relationship and went from there, and then we just got married in June of this year. Terry: We actually worked it out where the wedding was during summer break, so it worked out great! Q. What made you go back to school and get your degree? Terry: I went back to school because I’m from a family of educators and I never completed my college, so after I got a job with the state of Texas, I decided to go ahead and finish my degree. I searched all over the place online and found Florida Tech, and really liked it because it was an actual school, brick and mortar. It had a football team and a basketball team, unlike some of the other online universities out there. So I decided to sign up and try it. Amy: Well when I had first met Terry, and we were dating, I already had my associate’s degree. After seeing him start back, I got the bug, and I was like, “You know what? I’m gonna get my bachelor’s.” So I decided to go back to school, even though I had the three kids and was working, and I’ve earned it. Q. Why did you choose an online program? Terry: I chose an online program because I already had a full-time job, and it allowed me the flexibility to continue my employment and be able to go back to school to finish my degree. Amy: I also chose the online program because of flexibility, but another reason is because I have two kids with serious illnesses, and I have to be close by. I work for the school district that they both go to, and that was my main reason. I chose Florida Tech because it adapted to all those things that I need to make it work. Q. What did you do to be successful in the online class? Amy: First you’ve got to have the dedication, and you’ve got to have a schedule. Every Sunday we would sit down and make our meals for the week, because we have three kids, and they’re going to school, and you still have to do stuff after school. We picked two or three nights per week when we just did nothing but study. The kids all worked with us, we had a study session where they were doing their studying and we were studying at the table as well. Any time major exams came up, we would work it so we could get off at our day job, because he and I had both been at our jobs for quite a long time – we’ve had tenure there – so that helped out a lot. Terry: We even turned our dining room into a study and we just had family study sessions during the week and on the weekends, so it really worked out great. Especially when we were in the same classes, it helped a lot. Q. Is there any advice you’d like to share with other online students? Amy: The advice that I have is that you have to have the dedication and push yourself. At times it might feel difficult, but if you push yourself, what you get in the reward is so worth it. And I know that first hand. Terry: My advice to other students would be the same – to push yourself through it. There’ll be times where you’ll think, “This just can’t be done,” but it can. Through some dedication and hard work, you’ll be done. Q. What did you enjoy most about your online experience? Amy: The part that I liked the best was the adaptability, but also the different people, the group projects that we shared. I got to meet a lot of people, I got to speak to them on the phone, text – you actually become friends with some of your fellow students. Terry: What I enjoyed most about my online experience was the flexibility. Also, meeting people from all across the United States – it was really interesting to work with them. Q. Who supported you in your academic journey? Amy: [Terry] helped me, but my kids did too. They had to take over when Mommy couldn’t because Mommy was too busy studying, so it was a big support system. Also my mom, so it was a family support system. Terry: Amy was a huge support for me. The kids, they helped us out a ton. I believe we came closer during this process as a family. Q. How did your student services representative help you along the way? Terry: Malaney, our student services representative, helped us a ton during this process. She was able to coordinate some of our classes together where we could be in the same class. She made sure we were on time and took the right classes when we needed to. She was just great – very, very helpful. Amy: Malaney would help us out, basically she would let me know what was coming up next, either I could be close to Terry or maybe use the same books, which helped with the money situation. And she always was really good about reminding us to keep our assignments turned in and asking every week how it’s going and if there’s any problems. She would reach out to the professors for us. She was really instrumental in pushing us, and I appreciate that. She also helped us graduate at the same time. We called her in February and found out how many [credits we needed]. I was a little less than Terry on the credits, so Terry actually stayed out one semester, which helped. He could do more of the chores around the house and stuff and I could focus on studying more. So she helped us pick it out so that it would be right at the same time. Q. Now that you have your degree, what are your plans? Terry: I’ve been working for the State of Texas for 10 years. Now that I’ve got my degree, I plan on advancing my career, and I’m actually in the process of trying to become an auditor for the State of Texas. Amy: Now that I’ve got my degree, I am trying to actually become a director in the school I’m working with still, I’ve been working there fifteen years. After my kids are actually finished, I’m looking also at the State of Texas. Q. What was the most rewarding part of your academic journey? Amy: Knowing that I did it and it’s finished! And I got the bachelor’s. Terry: Same here, knowing that I’ve actually accomplished this. It’s been really amazing. And it’s been a great journey too.